You can’t go anywhere these days without hearing about the elusive, purportedly mystical powers of influencer marketing. According to a recent study comprised of marketers from a variety of industries, 94% said influencer marketing was an effective campaign strategy. That’s great news for marketers — right? Not so fast. Even though a majority of marketers believe influencer marketing is a viable tactic, it’s still incredibly challenging to report accurately on influencer campaign ROI. In fact, 78% of marketers said that determining the success of influencer marketing campaigns would be a top challenge this year. So even though the tangible benefits of influencer marketing — follower engagement, driving traffic, and creating more authentic content — seem clear-cut, there’s still a lot of progress to be made in making this form of campaign measurable for agencies and marketers. Let’s back up for a minute. How exactly do you perform influencer marketing, and how does it differ from the traditional celebrity spokesperson advertising model? And while there is often a formal agreement in place between both parties, influencers tend to be more selective about their affiliations, choosing to partner with brands that reflect their unique personal brands and won’t alienate their followers. Demographic: Is this person’s following similar to your company’s buyer persona? Does he or she affect the same people? In other words, celebrity product endorsements are less about engagement and more about attaching a person’s fame and name recognition to a particular brand — regardless of who specifically follows their career. For brands, this type of campaign is much more about grabbing the attention of a wide audience than tapping into a very specific niche. To give you an idea of how brands — both big and small — are leveraging the power of influencers in their marketing efforts, we’ve put together a list of ten influencer-driven campaigns. Check them out below and decide for yourself: Is influencer marketing worth the hype? Not only did Sprint cause Verizon’s famous “can you hear me now?” guy to switch to Sprint, but the company has collaborated with musicians, entrepreneurs, and actors to gain the attention of a massive young audience. Old Navy is a veteran of influencer marketing, having partnered with fashion and lifestyle bloggers all over Instagram to promote various lines of Old Navy clothing. For Black Friday, the company doubled down on this strategy by partnering with New York Yankee retiree Alex Rodriguez to raise money for the Boys & Girls Club of America (BGCA). Being an alumnus of the BGCA, Rodriguez’s promotion helped Old Navy raise $1 million as part of sales during Black Friday alone. Danielle Bernstein’s fashion blog, We Wore What, recently joined Fiji Water to create Bodyworewhat, an influencer marketing campaign offering eight-minute workout videos with Bernstein and personal trainer Eric Johnson. This campaign was meant to demonstrate Fiji’s commitment to hydrating those who want to look and feel as fit as Bernstein, while helping her fans get there with all the right motivators. Not all influencers are based in sports, fashion, or entertainment — not in Asia, anyway. The cafe chain, Kaikatsu Club, recently launched a virtual reality feature across its Japan locations, where customers can play various VR video games while enjoying a drink or a meal. And who better to help spread the word than Japan’s popular TV personality and cosplayer, Enakorin. Enakorin is well known by fans of anime, a Japanese artform responsible for many comics and TV shows across the country. Enakorin is also known for her love of video games, making her a perfect choice to represent Kaikatsu’s new VR entertainment platform. Both of them teamed up with TimeLine Japan on YouTube to talk about it. H&M has one of the largest Instagram followings of any fashion brand on social media today, due in large part to its influencer campaign with women who reflect H&M’s style all by themselves. Cyrene used her Snapchat account to document her journey to the event and ultimately give her audience a sneak peak of the new device. Using Snapchat’s 10-second video format, she posted clips showing her followers some of the device’s new features. See how CyreneQ’s Snapchat designs look for the brands she’s worked with here. Diageo, the parent company of Scottish whiskey brands Lagavulin and Oban, was awarded a Shorty Award for Best Influencer Marketing Campaign for this yule log video starring Parks and Recreation’s Nick Offerman. The 44-minute video shows Offerman sitting by a crackling fireplace, staring broodingly into the camera, and occasionally savoring a sip of his drink. Thanks to the simple seasonal premise and Offerman’s unique brand, the video was a viral hit. GAP’s successful Styld.by campaign featured a number of influential social media personalities from blogging giants like Refinery29 and WhoWhatWhere, showing how they incorporate GAP clothing into their personal wardrobes. 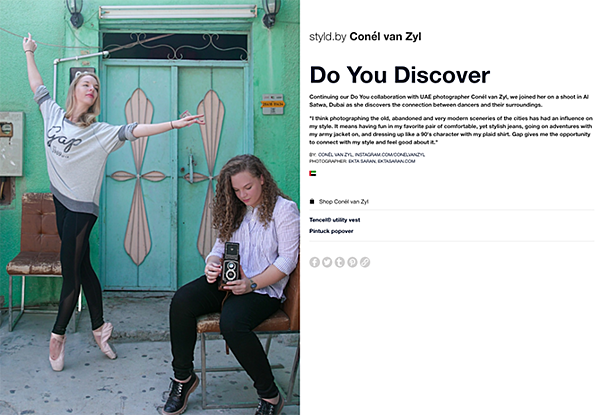 Users viewing the influencers’ posts on social media were given options to “Shop this Look” conveniently in the caption of photos. Thanks to the involvement of multiple influencers from different niches, GAP’s campaign had enormous reach. If anyone has figured out how to gain a loyal following on Snapchat, it’s hip-hop artist and producer DJ Khaled. Once a minor figure in the music world, Khaled has enjoyed an unprecedented level of success on the ephemeral photo-sharing app, with each of his snaps garnering over 3 million views on average. His “King of Snapchat” status means Khaled is in high-demand for influencer campaigns with brands. 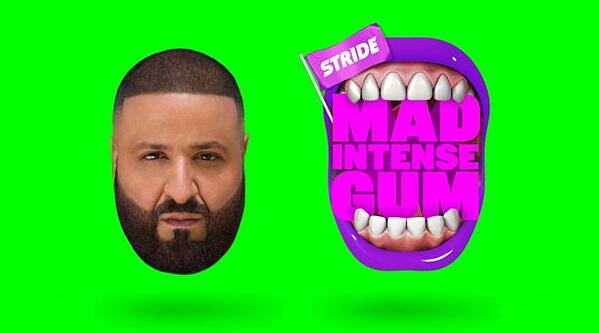 He regularly takes part in “Snapchat takeovers,” where a brand hands over the reigns of their corporate Snapchat to Khaled for a brief period of largely unfiltered antics. This bottled smoothie brand is edging its way into the beauty, fashion, and health scene on Instagram with help from key influencers in the space. Lifestyle bloggers like Kate La Vie (below) share sponsored posts featuring snapshots of their daily outfits and beauty essentials — including a strategically placed Naked Juice in the mix. High-end accessory and footwear brand Loeffler Randall has become a favorite among artists, bloggers, and fashion insiders, thanks in big part to the company’s commitment to involving social media influencers in its marketing campaigns. This Manhattan-based beauty startup (which was recently named one of Fast Company’s Most Innovative Companies of 2017) owes much of their seemingly overnight cult status to their ever-expanding network of super fans and micro-influencers — those people who may have high influence, but low individual reach. Instead of paying a few big names to promote their minimal skincare and cosmetics, the brand relies on “regular women” to spread the word. “What’s very motivating to us is this idea of every single woman being an influencer,” Glossier CEO Emily Weiss told Quartz. 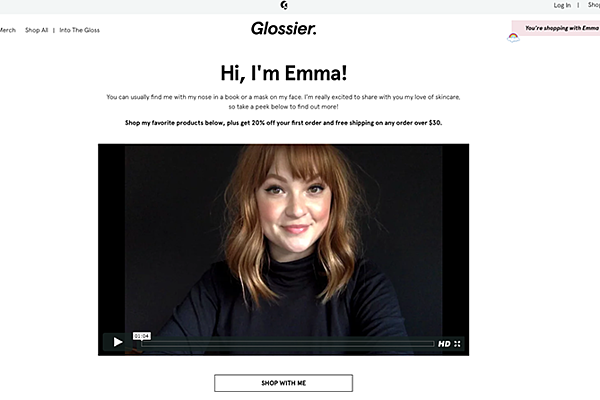 Glossier recently introduced a referral program to enable its more influential followers to offer product discounts and other incentives to their unique networks.